The Grand Canyon can overwhelm first-time visitors. As the name suggests, it is vast — 277 river miles long, up to 18 miles wide, and a mile deep, in fact. Planning your first visit there? Here is a quick overview of what, where, and how to see this incredible natural wonder. Grand Canyon Village, located in the South Rim, is the most convenient and most popular area for travelers to see the Grand Canyon. The Village, which is open all year, includes restaurants, a lodge, and Visitor Center. The South Rim also offers several bus routes with scenic overlooks and opportunities for hiking. The main downside to the Village is that it is typically quite crowded. However, there are some ways to increase your chances of avoiding long lines, finding parking, and getting that unobstructed view of the canyon you envision. Arrive by 9 a.m. if possible to ensure that you get a spot near the Visitor Center. If you arrive later, you can still park in a lot near this location, but expect a longer walk to places of interest. From the Visitor Center, you have several options to explore the Grand Canyon. You can walk along Rim Trail or choose to take one of many free shuttle busses offered by the park. Hermit’s Bus Route is highly recommended, especially in the morning when crowds are at a minimum. This is a scenic route and has many stops, so you can disembark to soak up the views at the overlooks or take a leisurely walk from one bus stop to another, enjoying the great outdoors. If morning isn’t an option for you, no worries. You can still bypass some of the crowds by going to Desert View Drive, about 20 miles east of the main entrance. Desert View has plenty of places to park and many spots to stop to see the Grand Canyon. The North Rim isn’t quite as easy to access, but the payoff is a far less crowded space. The North Rim has a shorter season (mid-May to mid-October), but offers a Visitor Center, a lodge with restaurants, and a campground. There is a paved trail from the Grand Canyon Lodge to Bright Angel Point that offers spectacular views. If traveling to the North Rim, two beautiful overlooks are Point Imperial and Cape Royal, both reached by scenic drives. You can also fly to the Rim from Las Vegas. The West Rim is the portion of the Grand Canyon closest to Las Vegas. It’s best known as the home of the Hualapai Reservation, and it has been the historical home of the Hualapai for generations. The West Rim is popular for its outdoor activities, including rafting. Helicopter tours to the West Rim depart from Boulder City and Las Vegas. The West Rim is also where you’ll find the famous Skywalk, which allows visitors to walk out over the edge of the rim, 4,000 feet above the canyon floor, on a glass horseshoe-shaped walkway. You can take a helicopter to the Skywalk directly from Las Vegas. For many people, a trip to the Canyon just wouldn’t seem complete without going below the rim. It can get extremely hot during the summer and during heat waves, making it dangerous to hike. So, if want to avoid the high heat, shoot for a trip in spring or fall. For a relatively short, easy hike with grand views, take Kaibab Trail either to Cedar Ridge or Skeleton Point. A slightly more challenging option is Grandview Trail. 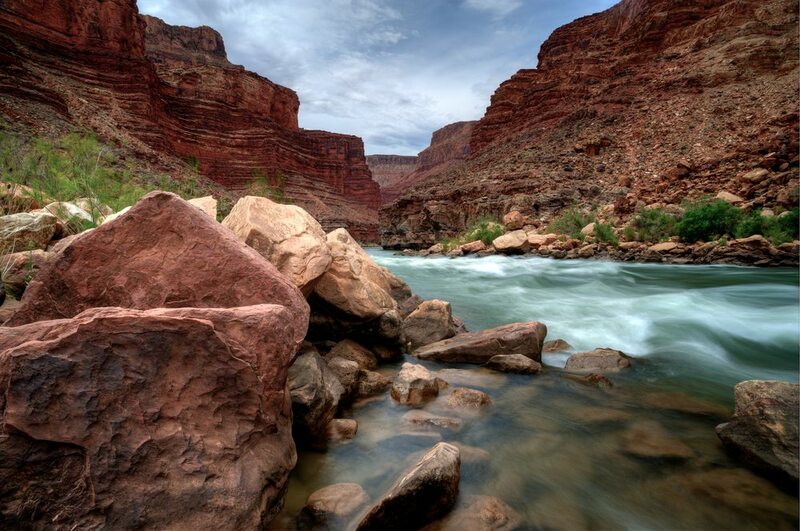 For a longer hike, try Bright Angel Trail to Plateau Point, which ends with an incredible view of the Colorado River. Did you know you can have a bird’s eye view of the Grand Canyon from a helicopter or airplane? You can take a helicopter right from Las Vegas to the West Rim, where you can either explore by foot or continue on a helicopter tour of the Rim. It’s a totally different perspective than from the ground — and you don’t have to deal with hordes of tourists. Guests can also take an express flight to the South Rim, and from there they can explore by ground or with a helicopter tour. Bus tours are also available that take all the guess work out of which overlooks to stop at and where to eat. Looking for a more rugged adventure? You can also explore the canyon on an ATV or raft! The professionals at The Tour Exchange know the Grand Canyon well. For a once in a lifetime Grand Canyon experience from the air or from the ground, book your Grand Canyon trip with us today.